Switzerland: The World Baseball Softball Confederation today unveiled the Game schedule for the U-15 World Cup 2018 to be held in Panama from 10-19 August. Nations in Group A: Will begin the global competition for the Title of World Champion at the new US$ 16 million, 8,500-seat Estadio Kenny Serracín in David -Province of Chiriquí. Nations in Group B: Will battle at the 3,000-seat Estadio Rico Cedeño in Chitré (Province of Herrera). Game 1: South America’s Brazil and European U-15 champion Germany will meet to open the youth World Championship. Game 2: Asia and Oceania’s U-15 continental champions — Japan and Australia — will collide. 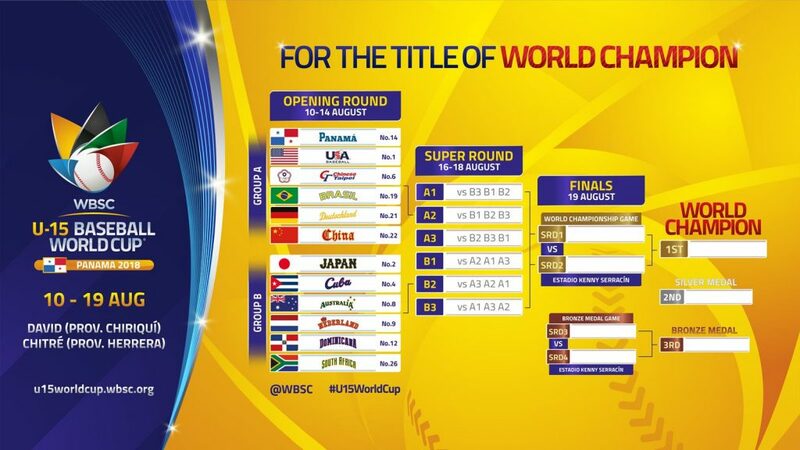 Game 3: Wild card China will make its U-15 Baseball World Cup debut against Americas U-15 co-champion USA. Game 4: European U-15 runner-up Netherlands will face two-time defending U-15 World Champions Cuba. Game 5: Americas U-15 co-champion Dominican Republic will meet Africa’s top baseball nation, South Africa. Game 6: Host Panama will open with the Asian continent’s U-15 runner-up, Chinese Taipei. 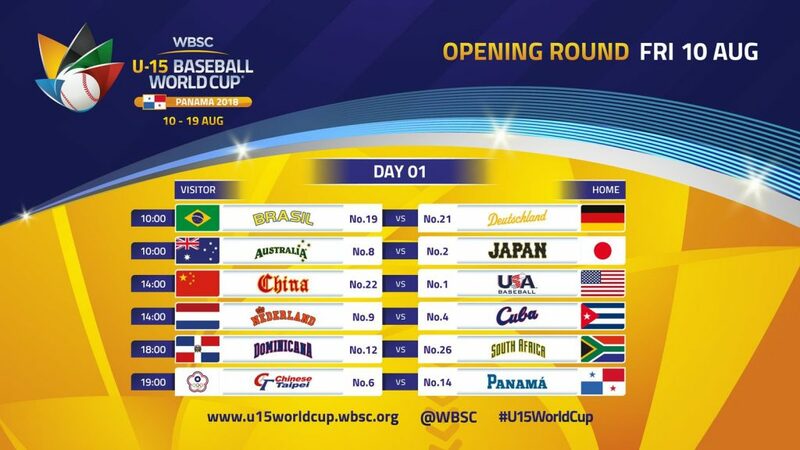 Day 3 will feature the re-match of the U-15 Baseball World Cup 2016 Final, Cuba versus Japan, which Cuba won, 9-4, to repeat as the top U-15 baseball team in the world. Following the 30-game Opening Round, the top three finishers from Group A will battle the top three finishers from Group B in a three-day Super Round at David’s Estadio Kenny Serracín. The 7th-12 Place Consolation Round will be staged at Estadio Rico Cedeño in Chitre. The top two nations in the standings following the Super Round will play For the Title of World Champion on Sunday, 19 August, at 18:00. The 3rd/4th Place Bronze Medal Match will be staged at the same venue at 13:00. The previous U-15 Baseball World Cup (2016) had a total broadcast reach of over 60 million households and attracted online viewers from 192 countries and territories. Previous articleBreaking World Cup 2018 – Denmark Vs France: And the Winner is…?